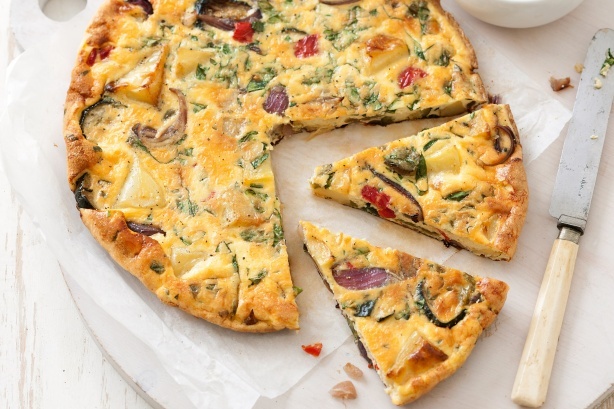 Frittata’s are the busy mums best friend. They are healthy, quick and easy to make, not to mention super tasty and really versatile! We love this flavour combo because it’s so perfect for Summer evening meals, but you can mix in as many or as little ingredients as you like (our second favourite frittata combo is prosciutto and asparagus, mmm). First of all you need to get your grill heating while you make the frittata. Heat the oil in a large pan, and throw in the roasted pumpkin and zucchini, cook until golden brown and tender. In a bowl, whisk up the eggs and cream and then add the feta and basil leaves – add as much salt and pepper as you usually would for your omlettes or scrambled eggs, everyone likes it differently! Pour the egg mixture into the pan with your veggies, reduce the heat and cook for roughly 8 minutes or until the frittata starts to firm up around the edges. Put the pan under the grill for about 5 minutes or until the frittata has set and is looking good and golden! Serve with a tasty garden salad to keep it nice and light! Mexican food is all about full flavours, and heaps of cheese, and you really cant go wrong with heaps of cheese can you? Fajitas are also a great sharing meal that brings the whole family together because you all dip in and out of the same bowls to create your wrap. Fajitas can be made with either steak or chicken, but we’ve opted for chicken here as it’s a little more child-friendly. 1 lime, just the juice! Mix together the spices, garlic, oil, lime juice and tabasco to make a marinade, add the chicken and stir well till it’s fully coated in the mixture. Add to a frying pan on a high, you want to cook the chicken so that its nice and charred on the outside, but still succulent on the inside. Add the red onion, capsicum and chilli and cook until tender. Put the salsa, guacamole, sour cream and grated cheese into separate bowls. And that’s it, you’re basically done, its really that simple! To serve, let the kids get hands on and make their wraps themselves – spread the sour cream and guac onto a tortilla, top with the chicken mix, salsa and cheese and then roll it up! YUM. 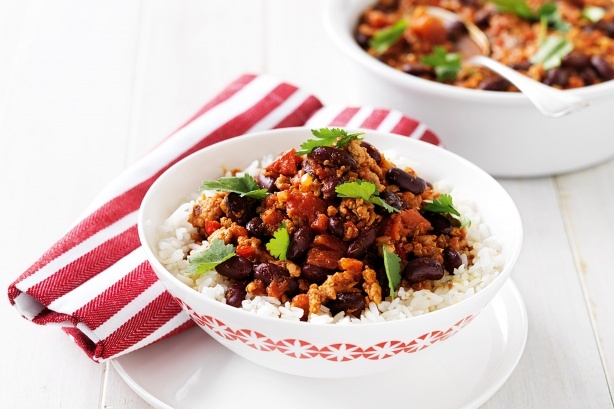 Chilli is a warm-hearty dish that really fills hungry tummies! It’s a great meal for cold winter nights, served with a hunk of bread, or on hot summers day with a salad. This one pot chilli is soooo easy, you could make it in the morning before work, or even on a sunday night before the busy week – once its done, just chuck the pot in the fridge and it’s there as soon as you need it! Chilli is super versatile too – you can adapt the ingredients to suit the tastes of your family. Heat the olive oil in a big pot, once its nice and hot, throw in the mince until browned. Add the chopped capsicum, along with any other veggies you fancy, stir until tender. Add in the baked beans, mixed beans, corn, chopped tomatos and seasoning. Cook on a low heat for about 45 minutes, stirring occasionally until the chilli begins to bubble. HOW EASY!? Top with sour cream to cool down your taste buds, and serve with either rice, bread or a salad. All of these recipes should easily feed a family of four, but feel free to adapt to suit your own. Don’t forget to share with us any tips or changes you make so we can try them out too, we love hearing from you guys! Still need some inspo? Join us at our One Fine Baby fair in Sydney next weekend to meet our amazing vendor Cooks Grocer. Cooks Grocer work with Sydney’s top restaurants and chefs to create healthy 30-minute menus each week. For just $10 per person, you could have these menus, along with the freshest available ingredients delivered to your door. How easy!? Visit our ticket page for more info on One Fine Baby Sydney on November 14 + 15.